Tunis: Results from Tunisia’s first free election were expected to hand victory to a moderate Islamist party on Tuesday, sending a message to other states in the region that long-sidelined Islamists are challenging for power after the “Arab Spring". With election officials still counting the ballot papers, the Ennahda party said its own, unofficial tally showed it had won Sunday’s vote, the first since the uprisings which began in Tunisia and spread through the region. Mindful that some people in Tunisia and elsewhere see the resurgence of Islamists as a threat to modern, liberal values, party officials said they were prepared to form an alliance with two secularist parties, the Congress for the Republic and Ettakatol. “We will spare no effort to create a stable political alliance... We reassure the investors and international economic partners," Jlazzi said. Two days after an unprecedented 90% of voters turned out for the election, officials were still counting the ballot papers in some areas. They said nationwide results would not be ready before Tuesday afternoon. “This is an historic moment," said Zeinab Omri, a young woman in a hijab, or Islamic head scarf, who was outside the Ennahda headquarters when party officials claimed victory. “No one can doubt this result. 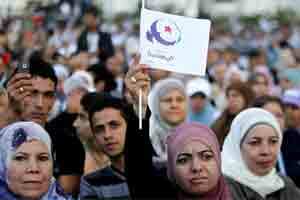 This result shows very clearly that the Tunisian people are a people attached to their Islamic identity," she said. The result is likely to resonate in Egypt, which is holding its own post-revolution election in November. An Islamist party which shares much of the same ideology as Ennahda is predicted to perform strongly. Tunisia became the birthplace of the “Arab Spring" when Mohamed Bouazizi, a vegetable seller in a provincial town, set fire to himself in protest at poverty and government repression. His suicide in December provoked a wave of protests which forced autocratic President Zine al-Abidine Ben Ali to flee to Saudi Arabia the following month. The revolution in Tunisia, a former French colony, in turn inspired uprisings which forced out entrenched leaders in Egypt and Libya, and convulsed Yemen and Syria - re-shaping the political landscape of the Middle East. Ennahda is led by Rachid Ghannouchi, forced into exile in Britain for 22 years because of harassment by Ben Ali’s police. A soft spoken scholar, he dresses in suits and open-necked shirts while his wife and daughter wear the hijab. Ghannouchi is at pains to stress his party will not enforce any code of morality on Tunisian society, or the millions of Western tourists who holiday on its beaches. He models his approach on the moderate Islamism of Turkish Prime Minister Tayyip Erdogan. The party’s rise has been met with ambivalence by some people in Tunisia. The country’s strong secularist traditions go back to the first post-independence president, Habiba Bourguiba, who called the hijab an “odious rag". “I really feel a lot of fear and concern after this result," said Meriam Othmani, a 28-year-old journalist. “Women’s rights will be eroded," she said. “Also, you’ll see the return of dictatorship once Ennahda achieves a majority in the constituent assembly." Samir Ben Amor, a senior Congress for the Republic official, said he welcomed that move. “We are ready for a coalition government on the basis of a unified programme," he told the news agency. “It is possible that Ennahda, Ettakatol and the Congress could form the new government." The highest-profile secularist challenger to Ennahda, the Progressive Democratic Party (PDP) conceded defeat. It had warned voters that modern, liberal values would be threatened if the Islamists won. “We congratulate the winner and we will be in the ranks of the opposition," a party statement said. Ennahda’s win was a remarkable turnaround for a party which just 10 months ago had to operate underground because of a government ban and which had put hundreds of followers in prison.